1. 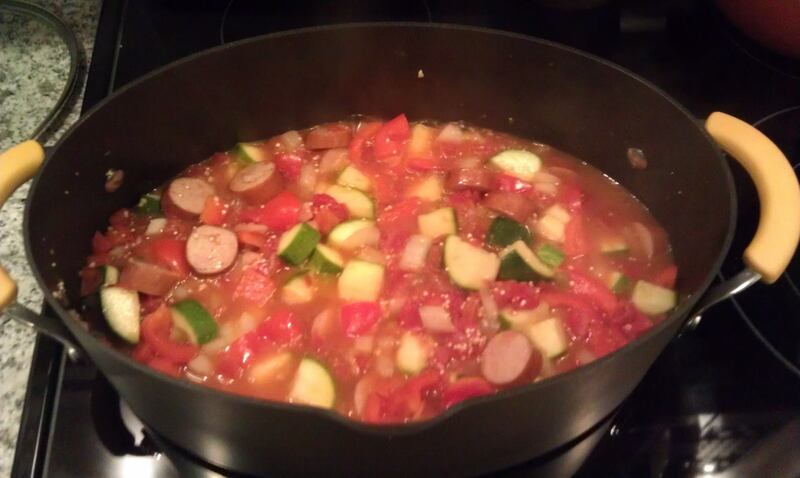 Saute onion, zucchini, bell peppers, garlic, & sausage in a pan for 5 minutes (you will need a large pan!). 2. Add the quinoa & stir. Cook 2 minutes. 3. Add broth & tomatoes bring to a boil. Reduce heat cover. Simmer for 10 minutes. 4. Add shrimp & cover to simmer again. Simmer for 5-10 minutes (or until the shrimp are cooked through). 5. Add sea salt pepper to taste.